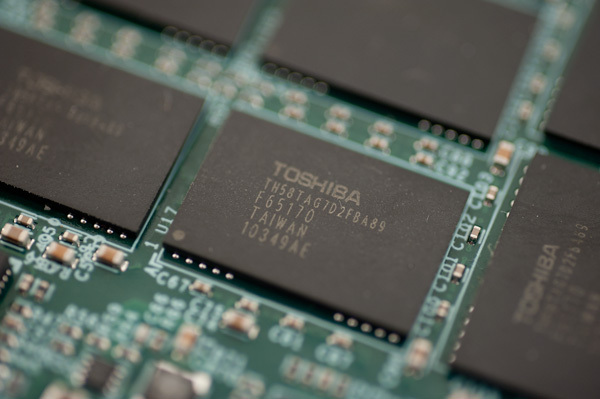 A 50nm MLC NAND cell can be programmed/erased 10,000 times before it's dead. The reality is good MLC NAND will probably last longer than that, but 10,000 program/erase cycles was the spec. Update: Just to clarify, once you exceed the program/erase cycles you don't lose your data, you just stop being able to write to the NAND. On standard MLC NAND your data should be intact for a full year after you hit the maximum number of p/e cycles. When we transitioned to 34nm, the NAND makers forgot to mention one key fact. MLC NAND no longer lasts 10,000 cycles at 34nm - the number is now down to 5,000 program/erase cycles. The smaller you make these NAND structures, the harder it is to maintain their integrity over thousands of program/erase cycles. While I haven't seen datasheets for the new 25nm IMFT NAND, I've heard the consumer SSD grade stuff is expected to last somewhere between 3000 - 5000 cycles. This sounds like a very big problem. My personal desktop sees about 7GB of writes per day. That can be pretty typical for a power user and a bit high for a mainstream user but it's nothing insane. If I never install another application and just go about my business, my drive has 203.4GB of space to spread out those 7GB of writes per day. That means in roughly 29 days my SSD, if it wear levels perfectly, I will have written to every single available flash block on my drive. Tack on another 7 days if the drive is smart enough to move my static data around to wear level even more properly. So we're at approximately 36 days before I exhaust one out of my ~10,000 write cycles. Multiply that out and it would take 360,000 days of using my machine for all of my NAND to wear out; once again, assuming perfect wear leveling. That's 986 years. Your NAND flash cells will actually lose their charge well before that time comes, in about 10 years. Now that calculation is based on 50nm 10,000 p/e cycle NAND. What about 34nm NAND with only 5,000 program/erase cycles? Cut the time in half - 180,000 days. If we're talking about 25nm with only 3,000 p/e cycles the number drops to 108,000 days. Now this assumes perfect wear leveling and no write amplification. 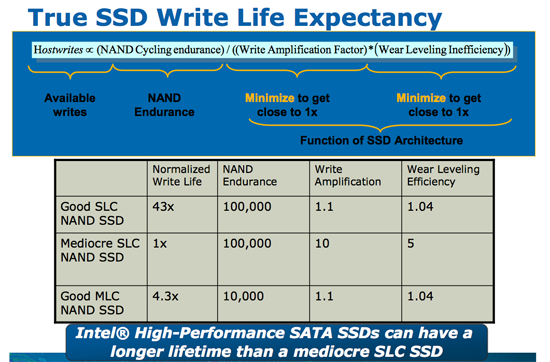 Now the best SSDs don't average more than 10x for write amplification, in fact they're considerably less. But even if you are writing 10x to the NAND what you're writing to the host, even the worst 25nm compute NAND will last you well throughout your drive's warranty. For a desktop user running a desktop (non-server) workload, the chances of your drive dying within its warranty period due to you wearing out all of the NAND are basically nothing. Note that this doesn't mean that your drive won't die for other reasons before then (e.g. poor manufacturing, controller/firmware issues, etc...), but you don't really have to worry about your NAND wearing out. This is all in theory, but what about in practice? Thankfully one of the unwritten policies at AnandTech is to actually use anything we recommend. If we're going to suggest you spend your money on something, we're going to use it ourselves. Not in testbeds, but in primary systems. Within the company we have 5 SandForce drives deployed in real, every day systems. The longest of which has been running, without TRIM, for the past eight months at between 90 and 100% of its capacity. SandForce, like some other vendors, expose a method of actually measuring write amplification and remaining p/e cycles on their drives. Unfortunately the method of doing so for SandForce is undocumented and under strict NDA. I wish I could share how it's done, but all I'm allowed to share are the results. Remember that write amplification is the ratio of NAND writes to host writes. On all non-SF architectures that number should be greater than 1 (e.g. you go to write 4KB but you end up writing 128KB). Due to SF's real time compression/dedupe engine, it's possible for SF drives to have write amplification below 1. So how did our drives fare? The worst write amplification we saw was around 0.6x. Actually, most of the drives we've deployed in house came in at 0.6x. In this particular drive the user (who happened to be me) wrote 1900GB to the drive (roughly 7.7GB per day over 8 months) and the SF-1200 controller in turn threw away 800GB and only wrote 1100GB to the flash. This includes garbage collection and all of the internal management stuff the controller does. Over this period of time I used only 10 cycles of flash (it was a 120GB drive) out of a minimum of 3000 available p/e cycles. In eight months I only used 1/300th of the lifespan of the drive. The other drives we had deployed internally are even healthier. It turns out I'm a bit of a write hog. Paired with a decent SSD controller, write lifespan is a non-issue. Note that I only fold Intel, Crucial/Micron/Marvell and SandForce into this category. Write amplification goes up by up to an order of magnitude with the cheaper controllers. Characterizing this is what I've been spending much of the past six months doing. I'm still not ready to present my findings but as long as you stick with one of these aforementioned controllers you'll be safe, at least as far as NAND wear is concerned. As a software engineer, I can tell you that temp files are used over in-memory storage because the s/w was originally written that way, and no bug report concerning them will ever reach high priority status because it is ranked as a system configuration issue that can be fixed by the user. In other words, inertia of the "good enough" file writing code (written when RAM was sparse) will prevent software from being re-written to more optimal in-memory usage. The long backlog of truly important bugs taking precedence insures that. The idea of moving the page-file to a RAM disk makes my head hurt. That's just retarded. You'd do better to turn off paging entirely, but that's also of questionable benefit because paging isn't really that hard on your SSD. I think a 1-2Gb RAM Disk is more than enough for browser and temp files, considering an initial starting RAM size of 4-8Gb of RAM. And yes, I do believe this improves system performance. Can you do the benchs? The point is that 1.5 years ago the OP purchased a SSD for $2.5/GB which had anywhere from a 2x-30x performance improvement over its predecessor (HD's), and here we are in 2011 reading a review about the next generation SSD which uses smaller, cheaper flash with half the available write-cycle life which is going to sell for... $5/GB and get a 1.2x-3x performance improvement over its predecessor (initial SSD's). Maybe we wil hear more of the hybride disks like the momentus XT from seagate in the future, for 'standard' users they can offer a lot. now they have a 4 gb flash with 500 gb but its 10 months old. I think lots of people are hoping they will multiply those specs.